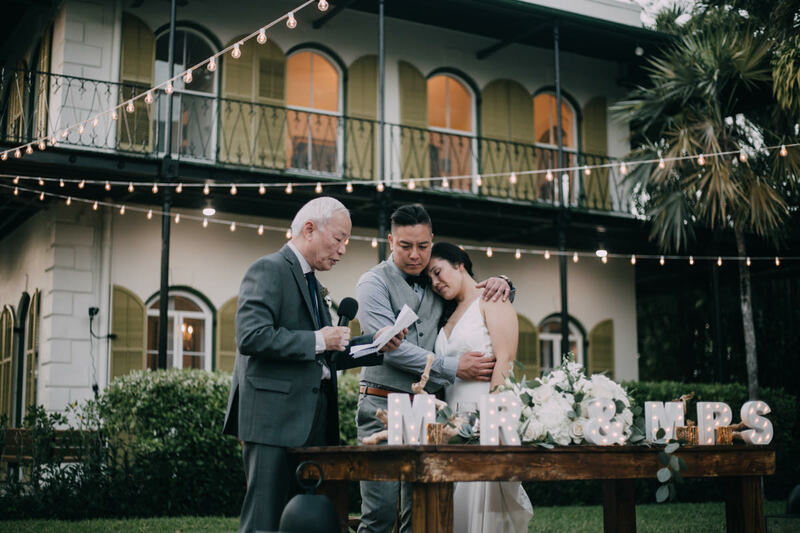 Karen and Dat fell in love with Key West for the first time here and the second time back, they brought everyone together for their intimate Hemingway Home wedding. What a weekend! We had a great time exploring the town, visiting the Southernmost Point and checking out famous Fort Zachary. Ultimately, we got together to celebrate their most special day at the heart of Keys! Karen walked down the aisle to the man of her dream, with tears in their eyes, and both hearts so full. It was touching for both of us seeing their love grow and eventually blossom. What I’ve learned from them: always trust your feelings, keep the faith, and don’t afraid to go wherever love takes you! Welcome to Key West with tropical weather, cool breeze, warm pools, delicious key lime pie! And yes, chickens run around the street like pedestrians! I know it’s going to be a very emotional day and I’m loving it! Karen & Dat exchanging love notes – their love is contagious! Being able to witness it grow over time makes me so happy! This is why I love what I do! Want helpful tips and new updates?